- Peel the potatoes, then cut them in cubes, and boil them. Discard the water. - Slice the red onion, then mix with the potatoes while they're still warm. - Hard-boil the two eggs. Remove the shell, then slice them, and mix them with the potatoes and onion slices. - Cut the kalamata olives in halves, and add to the mix. - Slice the pickled peppers, and add to the mix. - Add salt and pepper (to taste), olive oil and vinegar. Mix thoroughly. I like to mix until the soft outer layer from the potatoes mixes with the oil and vinegar, and transforms into a bit of paste that rubs off on other ingredients in the recipe. - This is the prepared part of the recipe. You can store this in the fridge. Always serve it at room temperature. In Romania, this is called an Oriental Salad. - What makes it a Spring Oriental Salad is the two fresh ingredients - the lettuce and the tomatoes. When serving the salad, wash the lettuce and the tomatoes, slice them, add them to the salad, and mix everything. - This recipe has such a beautiful mix of color, which makes it easy to present it to the guests. - Choose a nicely colored large plate or bowl (a color to compliment the mix of colors in the recipe), and use it to serve the salad. 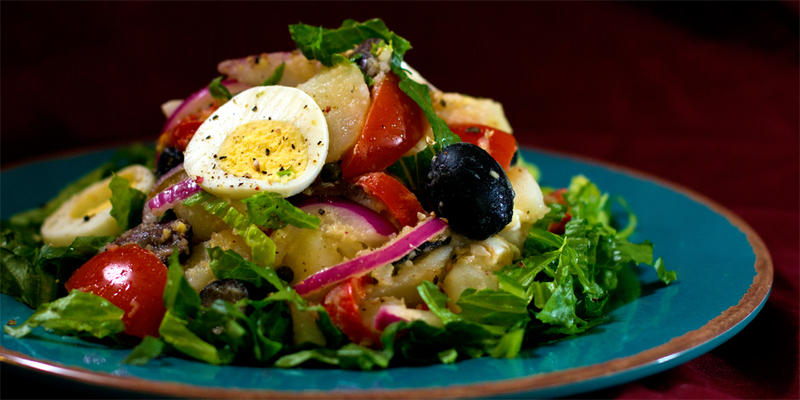 - Identify some slices of hard-boiled egg, and strategically place them on top of the salad. They just look good and tasty.